What Are the Benefits of Yoplait Yogurt? With 11 different types and more than 85 flavors, Yoplait no doubt has a yogurt to fit your taste buds and dietary needs. Like all yogurt, Yoplait's products are rich in nutrients that do your body good. Knowing the health benefits can help you set aside any guilt you might feel the next time you add Boston Creme Pie or Red Velvet Cake Yoplait yogurt to your grocery cart. Yoplait yogurt is a good source of both calcium and vitamin D, two nutrients that help keep your bones healthy and strong. Depending on the type of Yoplait yogurt you buy, one serving meets 10 to 30 percent of the daily value for calcium and 20 percent of the daily value for vitamin D. Many Americans don't get enough calcium or vitamin D in their diet, according to the publication "Dietary Guidelines for Americans, 2010." Adding Yoplait yogurt to your diet can help you meet your daily needs. When looking at the Yoplait yogurt label, you'll notice that it contains live active cultures such as L. acidophilus. These cultures are a type of bacteria that also live in your gut and sometimes go by the names of friendly bacteria or probiotics. 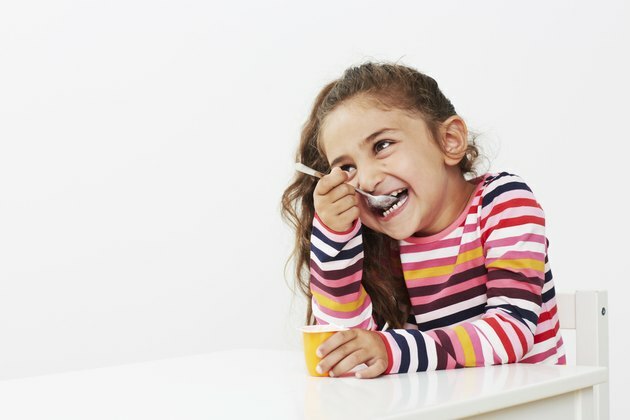 Eating yogurt like Yoplait helps replenish the friendly bacteria in your gut, which may help boost immunity and overall health, according to the Academy of Nutrition and Dietetics. Additionally, some strains of these bacteria may help reduce the symptoms of certain allergies, the academy says. The eating plan called Dietary Approaches to Stop Hypertension, a diet designed to help lower blood pressure, recommends two to three servings of fat-free or lowfat dairy foods such as Yoplait yogurt daily. Yoplait yogurt contains nutrients, namely calcium and potassium, that as part of a healthy diet can help lower blood pressure. Like calcium, the amount of potassium in Yoplait yogurt varies, depending on the type, ranging from 180 milligrams in the Yoplait Whips! to 290 milligrams in the Thick and Creamy. Aim for 4,700 milligrams of potassium a day for improved blood pressure. Lactose intolerance is an inability to digest lactose, the sugar in milk and milk products. A common problem in adulthood, it's more prevalent in certain ethnic and racial groups, such as African Americans, Asians and Hispanics. To avoid discomfort, people with lactose intolerance may limit or eliminate dairy products from the diet, which may impact their calcium and vitamin D intake. Yogurt in general contains less lactose than milk, and people tend to tolerate it better. Additionally, the friendly bacteria in yogurts like Yoplait also seem to help improve symptoms, according to the Academy of Nutrition and Dietetics. If you're wary of eating even a small amount of lactose, Yoplait also offers a lactose-free yogurt rich in calcium, vitamin D and potassium.